July 20, 2015 – While Scotch Whisky is by far Scotland’s largest non-oil export product, much of the industry is controlled by companies headquartered far outside of Scotland – a sore point for some Scottish nationalists. 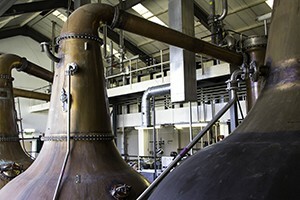 With the Scottish National Party (SNP) now dominating the devolved Scottish government in Edinburgh and Scotland’s Parliamentary delegation in Westminster, a group of party activists wants the SNP to consider some form of intervention in the whisky industry. According to the Herald Scotland, the group led by former Diageo executive Donnie Blair, labor union leader Bill Ramsay, and the Common Weal think tank are submitting a motion for consideration at the SNP’s annual party conference scheduled for October in Aberdeen. While the motion recognizes Scotch Whisky’s role in the Scottish economy, the activists want a bigger piece of the pie to remain in Scotland. That’s a direct shot across the bow at the multinational corporations that own most of Scotland’s whisky distilleries, including London-based Diageo, Paris-based Pernod Ricard (Chivas Brothers), Bahamas-based Bacardi (Dewar’s), and Japanese-owned Beam Suntory. The activists cite studies claiming that 83 percent of the Scotch Whisky industry is owned by non-Scottish companies, while only around 2 percent of the industry’s revenues stay within Scotland. There’s no guarantee that the motion will actually make it to the SNP conference agenda. Last week, SNP leader and First Minister Nicola Sturgeon praised the Scotch Whisky industry for its success in international trade, and suggested that the industry could be a model for other Scottish business sectors. It should be noted that, with a few exceptions, the Scotch Whisky industry was generally opposed to the 2014 Scottish independence referendum supported by the SNP on the grounds that it could upset global trade agreements worked out by UK diplomats over the last decade that protect Scotch Whisky exports. At the time, a number of industry executives privately expressed concerns that there might be some form of political “payback” for taking that position.